Spartacus, the escapee gladiator slave, forcibly evaded re-capture, and became the accidental leader of a two-year slave rebellion against the mighty Roman Empire. He has been seen ever since, as a hero for the disenfranchised, and an unassuming but unshakable voice for freedom. Spartacusis the third and final, of a series of three major pendant paintings; heralding the rights of every one of us, to believe in, and pursue our dreams. In each of these three paintings, the artist’s children are the protagonists in a scene where endeavours close to their hearts are the theme. Although the figure is small, they are significant in the composition; as, maybe we all are, in the scheme of things. In The Grand Reading Room, 1998 (commissioned by the Potter Museum, The University of Melbourne) his daughter, Jean, is the thirteen year-old on the stairs from childhood to adolescence; transported to another world by the book in her hands. She is engrossed with the magic of the words she reads, and unaware of the giant dome of the Latrobe Reading Room of the State Library of Victoria looming above her in the background. In Fanfare for the Common Man, 2003 (the title for Clinch’s retrospective exhibition at the Art Gallery Ballarat, 2013), his then seventeen year-old son, Allan, is the trombone player. Rising way above our lowly vantage point, he blows his mighty message to us all, from the derelict but appropriate brewery tower, in industrial inner-city Melbourne. The young man about to drop-punt the ‘Sherrin’ in Spartacus, 2013, is the artist’s 23 year-old son, Stephen. 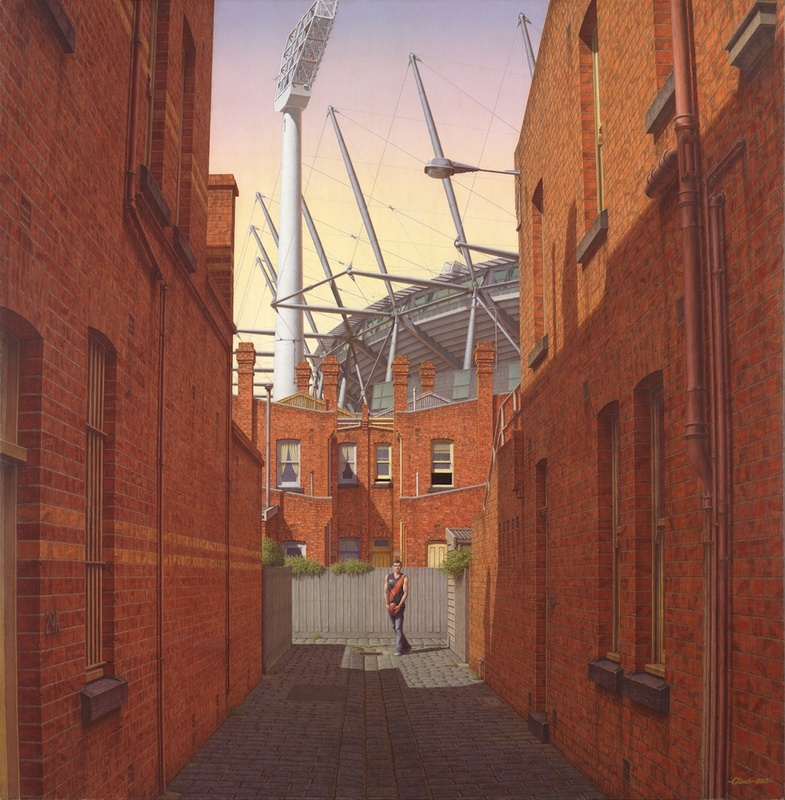 He stands at the far end of the typical bluestone laneway, perhaps the beginning career of many a star in the towering colosseum; the MCG, dominate in the distant sky. These are three major egg-tempera paintings of identical dimensions; three different ages in the artist’s three children’s growing awareness of their hopes and aspirations; and three different aspects of the culture that embraces them. “We’re sitting here looking at your most recent work, Spartacus, How long did it take to complete? Spartacus was as escape gladiator-slave. He became the unintentional leader of a slave rebellion, which took two years and the full weight of Rome’s military might to quash. Because slavery was the engine of the Roman Empire, they made an example of Spartacus by crucifying one thousand of the rebel slaves along the Appian Way. So Spartacus is the pin-up boy of the proletariat, the hero of the powerless rising against those who oppress them. So the painting shares some context with Fanfare for the Common Manand The Grand Reading Room, with its great ‘library for all the people’. And intergral to this is my daughter Jean’s love of literature, my older son Allan’s love of music and Stephen’s love of sport. I have him in front of the modern coliseum, the MCG, kicking a football to the viewer in an inner-city laneway. The interview by Julie Collett is quite lengthy and can be read further in the book Robert Clinch: Fanfare for the Common Man, which can be purchased through Lauraine Diggins Fine Art here.